Just like the physical world, the internet has its dark and seedy alleys. Use this tool to avoid them. With Web of Trust (WOT), once an individual spots a hazardous domain, it can be marked and thereby avoided by others. It’s like a crowdsourced guardian angel; who like the Evernote elephant never forgets. The service that you should learn how to use is called the WOT, and you should try out one of these browser extensions. It exists for IE, but I recommend changing to a superior browser. Essentially, WOT is a tool for personal online security and web safety. It’s intuitively easy to use. When you enable the extension in your browser, a color-coded safety alert appears next to each link. When you are on social media, search engines, or email apps, the extension will scan all links and provide more information. WOT works with Firefox, Chrome, IE, Safari, Opera, and has a Bookmarklet for other browsers. It works on Windows XP or later, Mac OS X, and Linux. The best way to contribute to the community of security concerned internet denizens is to go to the safe browsing tool’s website and create an account. Only certain features require creating an account and reviewing a site isn’t one of them. The icon will be colorless if you are on a site that doesn’t have enough reviews to receive a color rating. A blank WOT extension button will look like this. The pop-up will have two sliders that represent your answer to the following two questions. How much do you trust this site? How suitable is the website for children? Here is an example of a review I made for this site. When you click on a color, additional check box options appear. Must be at least 30 characters and no more than 20,000 characters. The last section has other users’ opinions listed, and you can click “I Disagree” to contest their statement. People have attempted to hurt competing sites by visiting and marking all the checkboxes under red – negative. If you try this, you’ll see a message that acts as a deterrent. Too many categories may result in people questioning the credibility of your review. Resist the urge to lie about your competitor’s site and direct that energy on improving your site. Additionally, if you want to give your website a good review, no one is going to stop you. When you enter a search query into a search engine, or should I just say “When you Google something”, each result will have a color coded mark from the Web of Trust extension. Watch out for the red and yellow flags. I have even found them next to paid ads. This one was marked for poor Customer Experience (CX) and misleading claims or unethical. I want to show you an example of a red flagged destination. To do this, I decided to search something shady. In the world of online marketing, the first shady thing that came to mind was blackhat SEO tools. With that said, here is the red flag example. 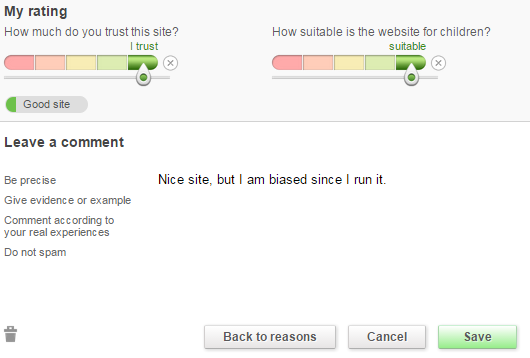 The Web of Trust window popups up when you hover your cursor over the red/yellow/green/blank circle next to each link. When you click to view detail you are directed to the WOT page for that domain. Check out the WOT listing for blackhatspot domain. The details show that only one user called it a scam. Noticing this could lead one to be skeptical about the review, either way, I’m not buying. It would be nice if there was a number next to each WOT mark with the number of users that it was sourced from, but maybe that will be part of the feature set soon. Let’s take a look at this yellow warning. In this case, it doesn’t seem any less threatening than the red warning. Black hat sites aren’t always dangerous. Don’t confuse dangerous sites with dangerous ideas, since black hat ideas can damage your organic search results. Often times, black hat SEO works well temporarily, followed by catastrophic and irreversible results. Search engine penalties will only affect you if you want organic traffic and other sites to link to you. I wish I had a sarcasm font because organic traffic and backlinks are such an essential part of an online presence. To demonstrate, here is a “safe” listing of a black hat site. Although I have found some red flagged links on page one of Google, search engines are generally in the business of providing high quality and relevant links. Since social media has many links which aren’t vetted by the platform, you’re more likely to end up in a dangerous part of town when clicking around in social media. Just remember that this is a crowd-sourced tool and since it depends on humans, it has its flaws. That means there’s always the potential for a site that is marked safe to be dangerous and vice-versa. Like many aspects of life, there are no guarantees and this is especially true when it comes to your browsing safety. As an interesting tid-bit, Google has a WOT page with 4,345 reviews, which you may find to be an interesting read. Additionally, users have considered their tracking services to be a privacy violation. The WOT app has been installed over 139 million times and 1.3 million times in Chrome. In the chrome app store, it has 4.5 stars sourced from almost 5 thousand reviews. Since anyone can create a user account and mark a site as safe or not, there is potential for abuse and false listings. To combat these, WOT has algorithms in place and they are likely working on perfecting them. More on WOT algorithms in a later section, after we break down a website review on WOT and a user profile. Here is a screenshot of the MakeUseOf WOT reputation page, so you can view all of the elements, or you can click the link to visit it yourself. Additionally, for those of you that use tricky HTML tactics, you can jump to a website’s listing by adding the domain to the end of the WOT URL like this. WOT has a scorecard for every domain whether it exists or not. Your profile consists of your username, the date you joined, a logo, number of posts, your ratings, and your activity score. Here is a view of my profile. I’m a WOT rookie, so it’s not much to look at. I have only reviewed one site and I uploaded a logo. Not much activity yet, but if I have a considerably bad or good user experience (UX), I will make sure to vote. Above the profile overview section, imaged above, there is a menu with the following options. Your Ratings is essentially a list of all the websites you have reviewed, your trust and child appropriateness rating with an option to delete the review. At the bottom of the page, you can export all your ratings in an XML format. Via email or social media, with a custom referral link. The custom referral link feature leads me to think it could be a factor in the assessment of your accounts authority and reliability. If you get a bad reputation rating, you can request it to be evaluated on the WOT forum. This will help you improve your reputation and your website. Engage with your website visitors in the WOT listing comments, and view comments, replies, and comments with replies for all your sites in the dashboard. When someone replies to your comment, you will get an email notification. Additionally, when you post a reply, that individual will also be notified. They may ignore the email, but this notification system increases the likelihood of an ongoing dialog. To verify your site you can add a meta tag to your homepage or add a specific keyword to your meta tag. Alternatively, you can download an HTML file and upload it to your root directory. To start the process, visit your site, click the WOT browser tool button, select “view details and comments” and click the “Click here if you own this site” button. Once a site has been verified by the owner, this button will disappear from their WOT Reputation page. Once you have verified your site, log in, and go to your profile by clicking the link in the top-right part of the screen. Alternatively, you can click the WOT browser toolbar extension and click on “My Profile”. Once there, click on “My Sites”, then the “Edit” link under Options, where you can edit your site’s description, which has a limit of 304 characters including spaces. If you look through information provided on the site, you find out that WOT has made steps to mitigate review manipulation. They don’t reveal their algorithms, like Google, to prevent people from gaming them. They explain that they assess the user’s “behavior” before deciding how much it “trusts the user”. They explain that they use “sophisticated algorithms to detect and eliminate any manipulation of reputation“. This is definitely a desirable feature in a crowdsourced tool and increases the public’s trust of reviews, but I remain skeptical because I like to know details. To continue, WOT says they understand that the average internet user isn’t security savvy, so they have a dedicated team of “experienced users” who review sites for safety and security threats. This is also a great feature, but I would like to know how big that team is and what makes them “uniquely qualified” to do that. After looking further, I got more clarification on how they assess user behavior. It is essentially a meritocracy where user’s votes are deemed more authentic based on their profile merit. In other words, the longer you are a user and the more active you are during that time, the more merit your reviews get. This system makes it more difficult for spammers to abuse since “bots have a hard time simulating human behavior over a long period of time”. It turns out that they also access third party sources of security information. As an example, they use listings of phishing sites such as PhishTank. Earlier in the article, I stated that it would be nice to know the number of reviews, but WOT says that it is not a reliable source of reputation and could be misleading, so they use a confidence indicator. Figuring out how this confidence indicator works involved looking at a couple reviews and comparing them. At first I didn’t make much of it but thought it was odd that there were different tints of green for the good rating. Here is a low confidence green rating. Notice that only one of the five people icons are filled in and that the green rating is actually a brighter tint of green than a high confidence green rating. Here is a high confidence rating. 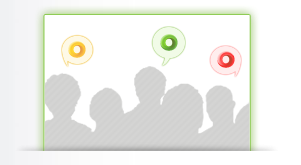 Notice that all five of the people icons are filled and that the green is darker. The average rating will have 2-3 people icons filled in. After you realize that each rating could have a variety of confidence levels, you can look at the color markers next to each link with a keener eye. Since the site has ratings for two categories, trustworthiness and child safety, the details page for each link has a separate confidence level and color assessment for each rating category. As a result, the color mark on each link in your browser is a mix of the two. If you want more information, you need to hover your cursor over the color marking and for the full details page click anywhere in the pop up. 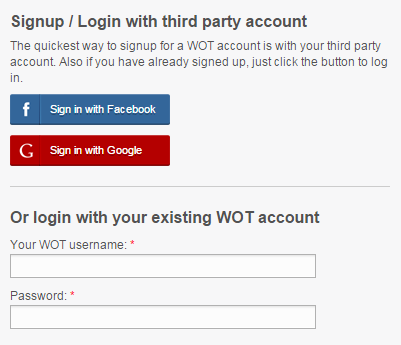 If you like WOT and want to spread the word, you can add a “Friend of WOT” badge to your site. You can add it anywhere on your website, but the likely place would be your footer. Here are what the three options look like. I am considering putting one of these in the footer for this site but haven’t yet made up my mind. What do you think? Please leave a comment below if you opted to put one of these badges on your site. Additionally, you can use the WOT widget so all the links on your site have a mark next to them, like the links on the Google SERP shown earlier in this article. When I put links up for this site, I check to make sure that the destination is safe. However, if you don’t moderate comments on your site, you are first running the risk of getting blacklisted by Google and secondly you risk sending your site visitors to dangerous sites. This widget could identify dangerous links posted to your site so you can remove them. After all, a site may be safe and then get taken over by a hacker, at which point it may become the host of malicious software. The code above is all that is necessary to use the widget. If you want it to appear on every page of your site, just add that code to your site’s footer. NOTE: WOT advises using the footer, likely to avoid a slow page load. After adding this code, all external links on your site will be marked with the WOT rating color. Additionally, you can control which links get the rating by using a variety of methods which can be found on their “add ratings to your website page”. I hope reading this article has given you insight into how this tool works and why you might want to use it. The internet is a big place and security is a big and growing concern. There are many organizations and people in the field of Internet security and there are many tools and solutions available. This site has a whole category dedicated to securing your use of the digital world. Please sign up for our newsletter to get regular updates of new articles regarding your online security.